This week, Laurier 4 Palestine (L4P), one of Wilfrid Laurier University’s working groups within the Laurier Students’ Public Interest Research Group (LSPIRG), is advocating on behalf of Israeli Apartheid Week (IAW). 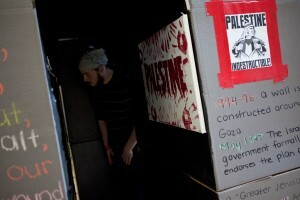 IAW began in 2005 in Toronto as a way to shed light on the struggle that Palestinians have been experiencing. Isra Al-Thibeh, one of the co-presidents of L4P, explained that Palestinians have been struggling for the past 65 years. L4P has been, and will continue to, host a series of events this week for students at Laurier in order to spread awareness and educate students on the current issues within Palestine. Attia also noted that it is important to spread awareness of this situation on university campuses. 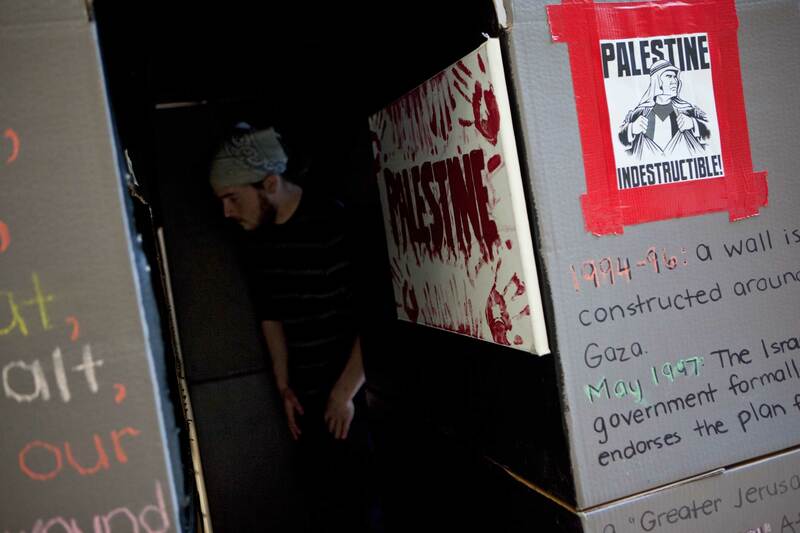 On Tuesday, L4P had built a simulation of the apartheid wall that exists along the West Bank. The wall, which was covered in graffiti and artwork that appears on the actual wall, also expelled sounds of gunfire and bombs going off. The wall was meant to symbolize both the hope and fear that civilians there experience on a daily basis. “There’s a lot of symbolism behind it all, and it’s a real thing — it segregates, and it’s important for people to know that this wall isn’t a good thing, it needs to come down,” explained Al-Thibeh. According to Attia, L4P’s goals with the wall, and other events they hosted, were to educate students at Laurier about the crisis that is still occurring. “Our goal this week is to kind of shed light on to those truths, on our truths about why this is such a passionate issue for ourselves, and why this is an issue that our society should take notice of, and that we should work together to do something,” she said. Al-Thibeh echoed Attia’s comments about the importance of raising awareness and educating students in order to eventually bring about positive change. The Cord once again proves its inability/unwillingness to post an objective article regarding the Israeli-Arab conflict. This isn’t an opinion article: it’s not acceptable to be calling the separation fence an “apartheid wall” in the newspaper’s voice. That’s not the official name, and it’s far from a neutral descriptor. Also, where’s the opposing narrative? For a controversial event such as IAW which is condemned by Canadian politicians from across the political spectrum, I’d expect to see some mention of the objection to this hateful demonization of Israel. Very disappointing quality of journalism and editing here. Why is the author of this article referring to Israel as ‘Palestine’? You have completely ignored the way in which this event was received by the student population. Why was this left out? The student population was very receptive, the people who showed up and made an effort that is, where were you Tamar? we didnt get the pleasure to speak to you and hear of your reception of the event. Or was the photos you took from a distance sufficient to compose your perspective? I will never understand the blindness and racism that enables people to defend Israel. Its in large part ignorance, Some of these people have never attended Laurier4Palestine events and never engaged us, but are the loudest protestors against the movement. They write articles, troll our pages, and attempt to stifle the voice of Palestine. They dont have an argument against the humanitarian crisis and genocide but they raise their flags and follow the leader in their misinformation. I’d like to point out that by definition, “apartheid” means a policy of segregation on the grounds of race. Is that not precisely what the wall intends to do? Political rhetoric aside, that wall separates or rather corners Palestinians into the West Bank not to protect the Israelis from a threat, but simply to allow them to enjoy luxuries at the expense of Palestinians’ basic necessities. Just because a point of view is not absolutely neutral or necessarily consistent with what the majority of people (i.e. Canadian politicians) believe, does not by any means make it not true. History speaks for itself and it’s kind of sad that as soon as Israel is mentioned in any negative context people are in an uproar over the fact that they were negatively depicted as opposed to addressing the claim itself, as though Israel is exempt from all criticism by default. The age of watering down the news to conform to people’s pre-established feelings is coming to an end. Tell yourself what you want but as far as the ‘hateful demonization of Israel’ goes, this article was rather mild and accurate at that. It is very disappointing of you actually to think that every news article has to contain an opposing opinion. to the contrary Palestine is being persecuted by Israel we all know this, no matter how Canadian politicians perceive it.We the people know the truth and the kind of persecution that Israel does to Palestine ! The record did a very good reporting on this. Would you mind showing me where Palestine is located on a world map? Actually Fatima, I was watching your mock checkpoint all day, and was listening to students reactions, all of whom were shocked at how Laurier could allow such offensive and disruptive activity to occur on campus. I have no interest in attending your events, as engaging in any discussion with you will never amount to anything constructive, as I have learned in the past. This Israeli citizen from Jerusalem thanks you for your action. A global BDS campaign against our apartheid government here is necessary. Fear not Harper and co.